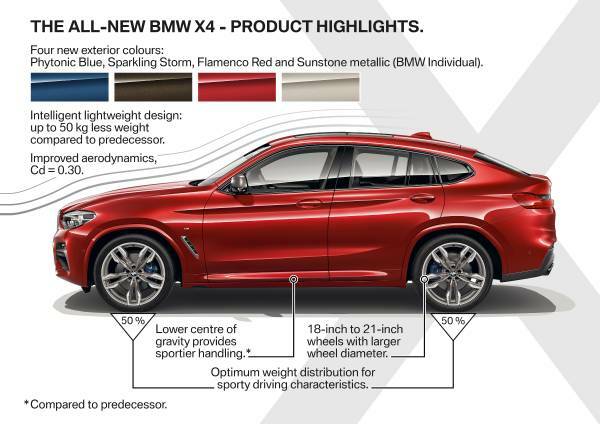 The new BMW X4 - Highlights (02/2018). 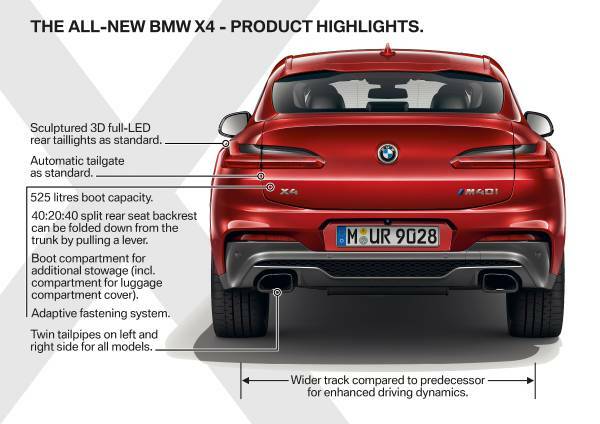 Exterior design of the all-new BMW X4 is a picture of powerful agility and self-assured presence. Increase in length (+81 mm), width (+37 mm) and wheelbase length (+54 mm) compared with the outgoing model. With extravagantly styled and dynamically stretched lines, the new Sports Activity Coupe adds an eye-catching athlete to the BMW X model family. 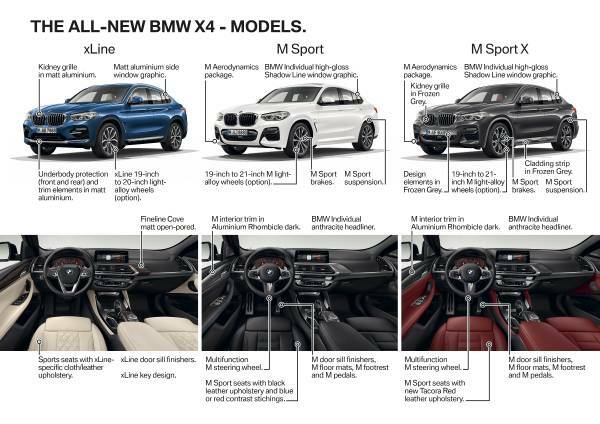 xLine, M Sport X and M Sport variants enable effective personalisation. The BMW X4 is available for the first time with exclusive options from the BMW Individual portfolio, allowing a vehicle configuration closely tailored to the customer’s personal style. Broad range of engines featuring three petrol and three diesel units and power outputs between 135 kW/184 hp and 265 kW/360 hp (fuel consumption combined: 9.0 – 5.4 l/100 km [31.4 – 52.3 mpg imp]; CO2 emissions combined: 209 – 142 g/km)*. Drive power is relayed via an eight-speed Steptronic transmission and BMW xDrive intelligent all-wheel drive (both standard on all models). 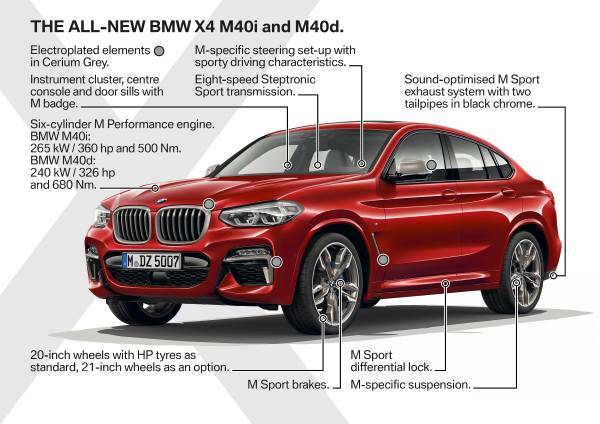 Two BMW M Performance models available: BMW X4 M40i and BMW X4 M40d boast phenomenally powerful engines, plus model-specific design and equipment features. 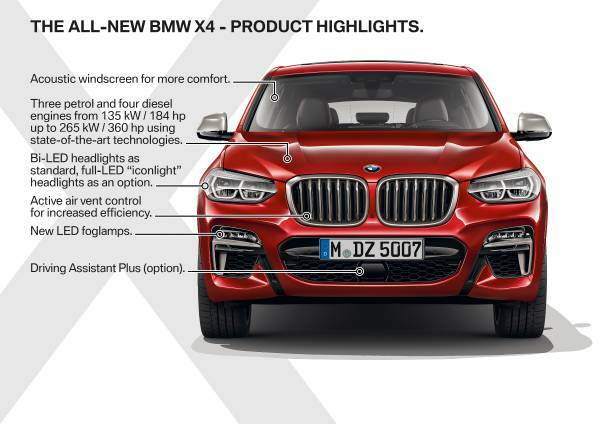 Noticeably superior driving dynamics courtesy of extensively upgraded and lighter chassis technology tuned specifically for the X4. First-class chassis systems fitted as standard or available as options: Variable Sport Steering, Performance Control, Adaptive M suspension, M Sport differential and M Sport brakes. Vehicle weight lowered by up to 50 kilograms compared to the predecessor model, thanks to BMW EfficientLightweight measures. Most efficient aerodynamics in its segment: drag coefficient (Cd) of 0.30. 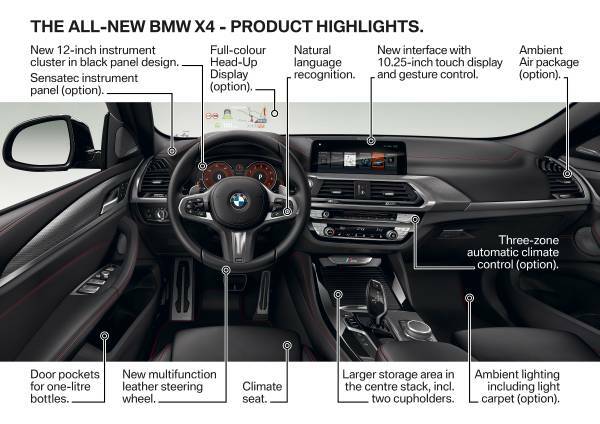 Latest version of the iDrive operating system and intelligent voice control fitted as standard, Control Display with touchscreen functionality and BMW gesture control available as options. State-of-the-art driving assistance systems enhance comfort and safety; optional Driving Assistant Plus including Steering and lane control assistant plus Lane Keeping Assistant with side collision protection. Comprehensive portfolio of services from BMW ConnectedDrive. BMW Connected personal mobility assistant provides seamless connectivity between the customer’s car and their digital lifestyle.